Electromagnetic metamaterials are man-made materials comprised of structures whose electromagnetic properties are deliberately engineered to offer a range of response difficult or impossible to achieve in naturally occurring materials or composites. Some astounding applications of metamaterials include (but are not limited to); negative index of refraction (where magnetic and electric response are simultaneously negative), “perfect” (sub-wavelength) lensing, and electromagnetic “invisibility” cloaks. 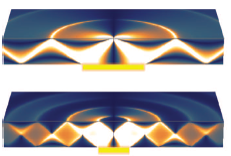 The Basov lab is focused at new implementations of metamaterials. In parallel, we investigate hyperbolic (meta)materials suitable for sub-diffractional imaging and focusing of infrared radiation. Hexagonal boron nitride (h-BN) is a natural hyperbolic material. Owing to this property, finite-thickness slabs of h-BN act as multimode waveguides for the propagation of hyperbolic phonon polaritons. Here we show, by direct nano-infrared imaging, that these hyperbolic polaritons can be effectively modulated in a van der Waals heterostructure composed of monolayer graphene on h-BN. 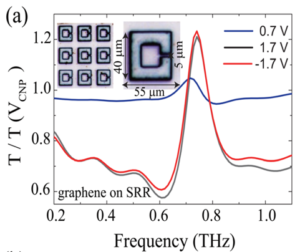 The hyperbolic plasmon–phonon polaritons possess the combined virtues of surface plasmon polaritons in graphene and hyperbolic phonon polaritons in h-BN. 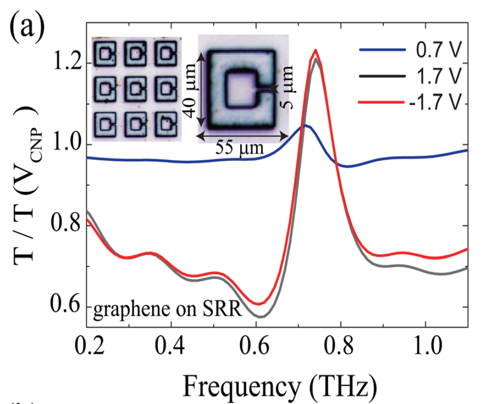 Therefore, graphene/h-BN can be classified as an electromagnetic metamaterial as the resulting properties of these devices are not present in its constituent elements alone. disks underneath the hexagonal boron nitride crystal. Our work opens new opportunities for anisotropic layered insulators in infrared nanophotonics complementing and potentially surpassing concurrent artificial hyperbolic materials with lower losses and higher optical localization. We demonstrate an electrolyte-based voltage tunable vanadium dioxide (VO2 ) memory metasurface. Large spatial scale, low voltage, non-volatile switching of terahertz (THz) metasurface resonances is achieved through voltage application using an ionic gel to drive the insulator-to-metal transition in an underlying VO2 layer. Positive and negative voltage application can selectively tune the metasurface resonance into the “off” or “on” state by pushing the VO2 into a more conductive or insulating regime respectively. 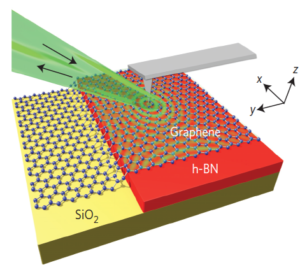 Compared to graphene based control devices, the relatively long saturation time of resonance modification in VO2 based devices suggests that this voltageinduced switching originates primarily from electrochemical effects related to oxygen migration across the electrolyte–VO2 interface.